Shirts With Random Triangles: Bob Stoops comments on Nick Saban's new contract extension. Bob Stoops comments on Nick Saban's new contract extension. 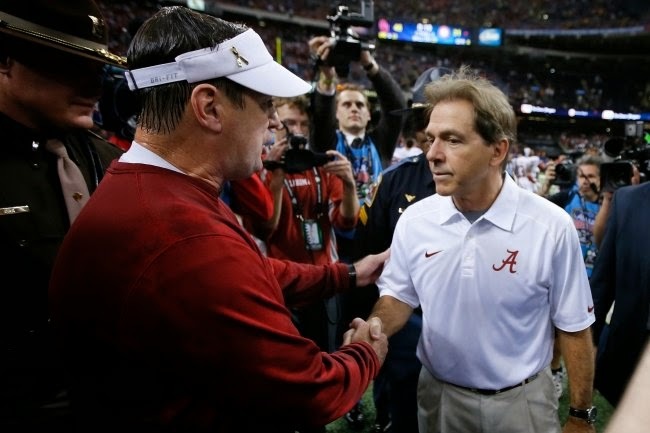 Bob Stoops and Nick Saban following 2014 Sugar Bowl. Photo via Bleacher Report. Oklahoma scored an upset against Alabama in the 2014 Sugar Bowl. So it's natural that The Tulsa World would ask him about Alabama head coach Nick Saban's new contract extension, which raises Saban's salary to $6.9 million dollars a year. To be more specific, The World asked Stoops if salaries for coaches like Saban were "getting crazy." Stoops was a little pragmatic about Saban's raise. "I don't know," Stoops was quoted as saying by The Tulsa World. "When you compare it to what maybe they bring in, probably not. Compare it to what they were bringing in before he got there and before the program's doing what it is now. I don't know. Business is business. I don't think anybody pays something that they're not able to afford, or that doesn't put them in a positive position. That's in all businesses." Stoops himself got a contract extension in Sept. 2013. So it's not like he can be too critical about Saban's raise. If Oklahoma manages to win the College Football Playoff title in the next few years, the chances Stoops himself gets another extension and big raise is probably a given.